MULTILPIER EVENTS – 2 SEMINARs in LITHUANIA “Entrepreneurship with vision in the farming sector” – 05.05.2018 and 28.06.2018 by Institute of Agricultural Economics in Lithuania in cooperation with Chamber of Agriculture of the Republic of Lithuania – Entrepreneurship with vision! The two seminars under title “Entrepreneurship with vision in the farming sector” – were organised by Institute of Agricultural Economics in Lithuania in cooperation with Chamber of Agriculture of the Republic of Lithuania, for wide national dissemination of the project results in Lithuania. The seminars were organized in Kaunas on on 02.05.2018 and 28.06.2018. Together 81 participants took part in the events: 26 young farmers and advisors in May, and 55 farm advisors, extension workers and few policy makers in June. 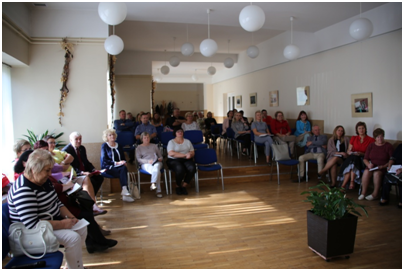 The seminar was held in Lithuanian and was led by Aldona Stalgienė LAEI and Simona Švoilaitė LRZUR . The program of the first meeting started with an introduction about the project and all project products summary, then there was a show of the ISM tool with computers, then introduction of marketing, business planning and networking modules to the farmers. It was followed by discussion and interaction with farmers. Second meeting for advisors and policy makers was organized in a similar way but with shortened version of the ISM Tool show, which was done on one example farm. The other presentations were similar. All presentations were followed by discussion. During the seminar participants received ISM+ project materials encouraging them to think about the farms in the strategic way and to use the project results. The feedback from the participants was very positive. Participants, mainly advisors, were from different regions of Lithuania, expressed intention to organise full training in their working regions. They understand the need of such kind of trainings for the farmers they work with. We expect that the seminar will result in a wide national interest in the new updated ISM Method and materials and new modules.